Celebrating the Crary's legacy with music and art. Sunday August 20th from 11 am to 4 pm. Entertainment at 12, 1 and 2 pm. Community Open House with a special presentation of Gustave Doré engraved wood printing blocks that were used to create the famous 1866 “Doré Bible”. Entertainment by The Methodist Madrigals, The Warren Philharmonic Quintet and female a capella quartet, Harmony Gals​. These are original engraved wooden printing blocks for Gustave Doré's world famous Illustrated Bible (1866). They depict two of the most dramatic foundational stories of the Old Testament, "The Murder of Abel" and "Expulsion from the Garden of Eden". The prints made from these blocks are very widely known. 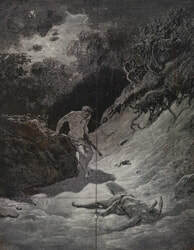 In 2014, at the entrance to the largest exhibition of Doré's art ever put together, the Musée d'Orsay in Paris mounted an eight-foot high reproduction of "The Murder of Abel" [as seen in photograph]. Each block consists of nine sections of boxwood that were glued together, polished, drawn upon, and then engraved with extremely fine-pointed instruments. 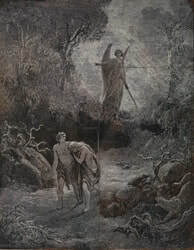 There is a slight reddish body color in addition to the black ink on the surface, a result of Doré's direct drawing on the blocks in red conté crayon. The delicate lines were inscribed by a master carver, Héliodore Pisan, after Doré made his detailed drawing. The surface that was not carved was rolled with black ink, and then put through a press to create the prints for his historic 1866 Bibles, a later copy of which is also on display here. These two engraved blocks are in very good condition considering their age of more than 150 years, with some separation between sections. The Crary Art Gallery is especially honored to have these historically significant and beautiful blocks on display, gifted to the Friends of Crary Art Gallery Collection by the Seastead Family of Warren.